A south swell is expected to combine with “king tides” this weekend to produce coast flooding in low-lying areas. 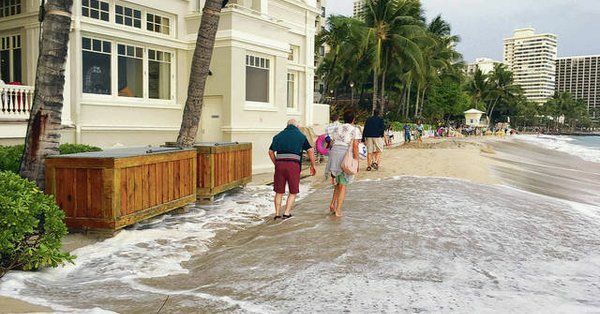 Federal & Local forecasters warn us: Hawaii’s shorelines will likely flood over the weekend as record-level spring “king tides” combine with a large summer swell. The Honolulu National Weather Service posted the statement Wednesday: coastal flooding plus erosion likely across the entire island chain for the holiday weekend. South shore beaches like Oahu’s Waikiki are most at risk. Plus, the South swell SNN’s been talkin’ about for 10 days builds on Friday and peaks Saturday at well above advisory criteria of 8′! We will see some spots hit 12′ faces or crest to trough! The large SSW angled surf with still be 10′ faces Sunday and 9′ in the face (5′ local scale) through Memorial Day! Combined with the highest tides of the year, known as king tides, forecasters expect water levels in Honolulu to reach peak levels Friday and Saturday evenings. A similar tide was experienced on the last weekend of April when Honolulu reported its highest tide on record. For the King Tides all Islands May, June, July GO HERE and don’t forget our own Tide Charts right here on SNN! Hawaiʻi-specific projections are in line with global projections of sea level rise (SLR) with a mean height of 3 feet by 2100 (1). In addition, the existing problems of chronic erosion in Hawaiʻi, which causes beach loss, damages homes and infrastructure and endangers critical habitat, will likely worsen with SLR. Hawai‘i Sea Grant is the Hawai‘i and U.S.-affiliated Pacific Islands project lead as part of the International King Tides Project – Snap the Shore, See the Future. Explore this interactive StoryMap featuring King Tides projects from around the world. who wants to keep the public from using it.